HMS Implacable - cartoon in pencis & watercolour - annotations - found in a scrapbook - Colin's mother was an accomplished water colourist - date is unknown, presumably 1912. Acting LT Colin F. Creswell RN was the fourth child of Admiral Sir William Rooke Creswell and Lady Adelaide Elizabeth Creswell, nee Stow. Colin was presumed lost at sea on 20 August, 1917 with all on board a submarine. The Admiralty suppressed all information about the submarine and its engagement. Colin's older brother LT Randoph William Creswell AIF, Camel Corp (B 1890) was also killed in action. Randolph's twin, LT Edmund Lindsay Creswell was wounded in action. HMS Implacable was originally a 74 gun French ship, the Dugnay-Trouin. This vessel was part of the action with HMS Victory at the Battle of Trafalgar 1805. The remnant of the French fleet which escaped from Trafalgar tried to make the Spanish port of Ferrol. Dugnay-Trouin, flagship of Rear Admiral Dumanoir-le-Pellay, was engaged with its sister ships in an action off Ferrol in November, 1805. A British squadron commanded by Sir Richard Strachan engaged and captured the French vessel. The Dugnay-Trouin was taken into the Royal Navy and renamed Implacable. After seeing action in the Baltic and off the coast of Syria, she became in 1855 training ship for boys at Devonport. IN 1912, she was lent to Mr. Wheatley Cobb and moored at Portsmouth as a training ship for sea scouts and similar organisations. Implacable was used as a store depot by Admiralty during WWII. She was the last surviving wooden ship of the line, with the exception of HMS Victory, until she was sunk in the English Channel in 1949, her timbers having then rotted beyond repair. Her service period with the RN was 144 years, plus of course, earlier service with the French Navy. Page 95, E47 - submarine work of any nature has special dangers, and this was certainly the case in submarine mine laying. A fate for some British mine laying submarines was to be blown up by the very seeds they were sowing, and RADM Poland's was near enough in Octobder, 1916 to hear in full the monumental explosion whic destroyed E47, when she was engaged in this work. RADM A. Poland " Reflections"
Can I leave this with you Mac? Do you please have any entries for Acting Lieutenant Colin Francis Creswell RN and Submarine E-47? He was serving in that boat that was presumed missing on the 20th. of August 1917, when she did not return from a patrol in the North Sea. There seems to be a paucity of information about that Submarine on the Internet. Any photos of E-47, and any History of her service in the Royal Navy would be much appreciated. Thank you for your e mail enquiry. I have attached a short biography of A/Lt CF Creswell and our database entry for HMS E47. Creswell was appointed to the Battle cruiser HMAS Australia on 24 May 1913 he was the son of Rear Admiral Sir William Rooke Creswell the first Member of the Naval Board Royal Australian Navy and Adelaide Creswell OBE of Fernadale, Silvan Victoria Australia. He was a native of Adelaide, South Australia, He is commemorated on the Portsmouth Naval War Memorial on Panel number 24. I would be interested to know why you are interested in Lt Creswell and HMS E47, are you a relative? Thought I might try the Archivist at the Submarine Museum at Portsmouth and BINGO! Here is his response attached. Of course, as so often happens, I become Mr Mackenzie, and their records spell Creswell incorrectly with two S's. Will point that out when I say thank you, I will try Debbie Corner to see if they have a photographic record of E-47. Will Bcc you with my response to George Malcolmson. My thanks for your information about Colin Creswell. No, I am not a relative, but a Past President of the Naval Historical Society of Australia ( Victorian Chapter ) and was researching Colin for a colleague. In Australia, his Father Vice Admiral Sir William Rooke Creswell is considered to be the Father of the Royal Australian Navy, he is buried at Brighton Cemetery, a Melbourne suburb. Two small things, my christian name is Mackenzie, but I have had confusion over which is my surname all my life, and I note your record of Colin, spells Cresswell with two S's, and I am sure you are aware that should read Creswell. I will contact Debbie Corner to ascertain if there is a photograph of E-47 on file. Again my grateful thanks for all your help. Your archivist has told me you look after the photographic records at the Submarine Museum in Portsmouth. Would you have any photographs of HM Submarine E-47 please? If so, I would be pleased if you could E-Mail any of them to me. With thanks for any assistance you can offer in this regard. Built Fairfield Shipbuilding and Engineering Co Ltd, Govan, Glasgow. Mean Draught 12 ft. 6 1/4 in. Range 41.67 tons of fuel oil to give 3000 miles at 10 knots surfaced. 99 Miles at 3 Knots Submerged. Armament Two 18-inch Bow Torpedo Tubes. Two 18-inch Beam Torpedo Tubes. One 18-inch Stern Torpedo Tube. 1 Gun Mounting - 12pdr. Max Speed 14 knots Surfaced. 9.5 knots Submerged. North Sea patrols off the German & Dutch coasts. Disposal Sunk, on or about 20 August 1917, in the North Sea. Cause unknown. Additiona Wreck found in 2002. I am searching for any details of finding the wreck of British Submarine E-47, she did not return from a patrol in the North Sea on the 20th. of August in 1917. I have read the wreck was found in 2002, but cannot turn up anything on that. Are you able to point me in the right direction please? Don't have anything on this mate, what I am going to do is file the mail and if anything crops up as I plough through my stuff I'll get back to you. Indeed everything is ok lots of work on at the moment and not enough time to complete it. 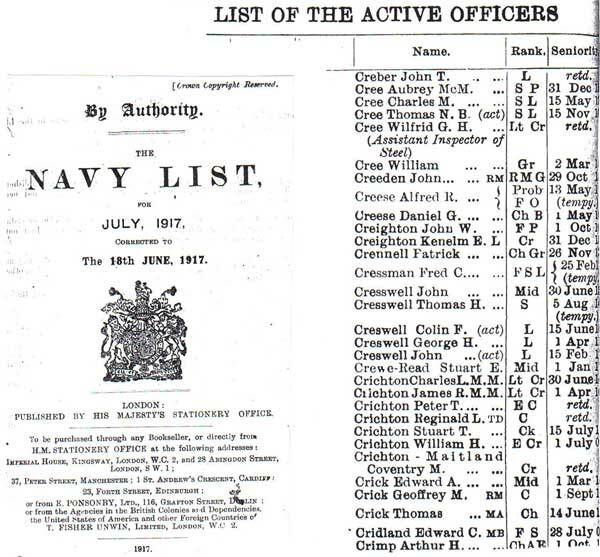 Scan of the July 1917 Royal Navy, Navy List from Daniel at the British Library in London. Colin Creswell was not in a later edition were I would have expected him to be, so I requested Daniel to look at any earlier copy, and here he is listed. 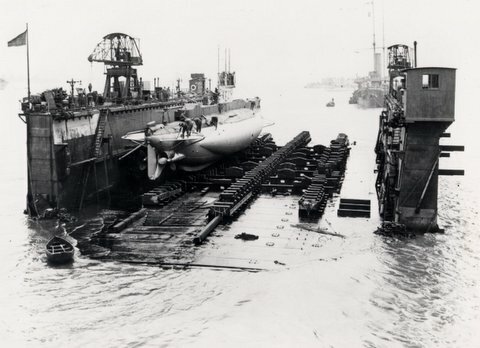 My grateful thanks for all your time and trouble in unearthing both the Navy list details about Colin Creswell, and the photo of his submarine E-47 in the floating dock in Harwich from The British Library, and the Submarine Museum at Portsmouth, and then airmailing copies to me. They arrived today. It is fascinating that some details about the J Class submarines from WW1 were also included, by a freak chance, my Father who went through WW1 in the Second Dragoon Guards Queen's Bays, mounted in France and Belgium, to be an Old Contemptable. With the Royal Australian Navy recruiting in UK to help man the J boats, he joined the RAN in London in 1919, and took passage to Australia in J2, being towed all the way. These boats were based at Geelong in Victoria, and because of that fact, I was born in 1922, in Geelong. I have done a Monograph about the J Class Submarines, and should you be interested, you will find it on my AHOY Web Site at this URL: "AE 1, AE 2, and J Class Submarines in The Royal Australian Navy"